If there is anything you are not happy with the set, contact us and we will replace it for free until you are happy or you money back. Your satisfaction is our pursuit! Please feel free to contact us directly when you encounter any problems. [Safe And Durable] Our product has been ASTM certified and are also CSPIA compliant. We always put the safety as our first priority. All magnets blocks use high quality original ABS material, and the rainbow color pieces have been through ultrasonic process for better tightness, perfectly prevent breaking apart. Make it safe for child with smooth hand-feeling. Shipping is FREE to all addresses other than APO/PO boxes in the lower 48 states. All our stock ships from our US-based warehouses. Shipped via USPS or UPS (depending on location and package weight) Unless stated otherwise, all orders will ship within 12 - 48 hours of your payment being processed. 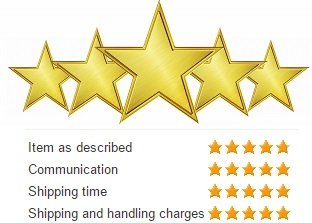 Check our feedback to see the great reviews of FAST shipping we offer.